Happy New Year everybody! 2013...we're living in the FUTURE. Woah. Of course, the first comics of 2013 aren't released until TOMORROW, but we can still take a look at the last few comics of 2012! Only 3 titles that I care about last week, but 2 of them promise big things! 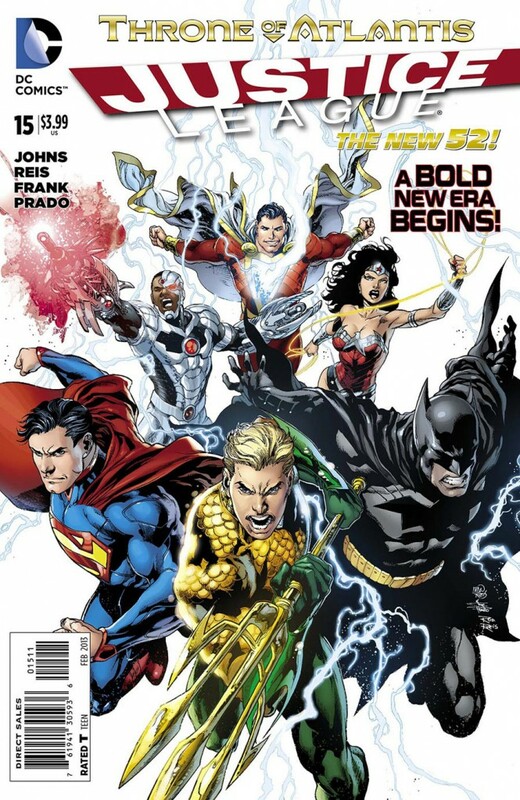 Let's take a look at DC's next big crossover, "Throne of Atlantis"! Justice League #15 - "Did Wonder Woman and Superman just catch an Aircraft Carrier?" That's right, another major cross-over comes to the DCU as this issue marks the official beginning of the "Throne of Atlantis" story-line that's going to be running in Justice League and Aquaman for the next few months! It all starts as aircraft carrier U.S.S. Mabus conducts a missile test that goes horribly wrong...the missiles launch early, and inexplicably their target has been changed to a location deep under the Atlantic Ocean! This must be sabotage, as of course, the target is Atlantis!! This unintentional act of aggression from the surface world spurs the Atlanteans, led by Aquaman's brother Orm (aka Ocean Master) to initiate their plans for WAR. We also get the even less-likely team-up of Batman, Mera and Aquaman in Gotham City! Cool! Great start to what looks to be an interesting story! Don't forget the Shazam back-up! Billy is starting to understand a tiny bit about what's happened to him. His new-found adulthood is not all just being legal to buy beer and watch R rated movies...he also has to fight crime! Too bad he's woefully unprepared to face a very pissed off Black Adam who, at least according to a magic mirror Billy encounters, is coming Shazam's way! Part 2 of "Throne of Atlantis" in Aquaman and a Before Watchmen title to boot, after the JUMP!! Aquaman #15 - "I could feel them in the water as I moved it Arthur. Bodies. The are so many bodies down there." "Throne of Atlantis" continues as the Atlanteans prepare for phase two of their war plans...a full ground assault on the city hardest hit by their tidal waves! They plan to sink that city into the sea! And which city is hardest hit?? Survey says...Boston! 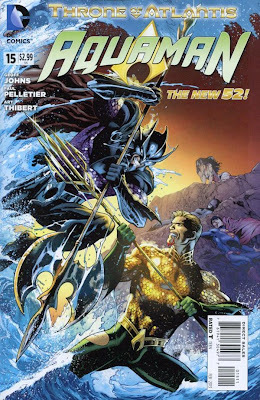 Before the Atlanteans can make their move, though, Aquaman talks Batman and the Justice League into letting him confront his brother and current King of Atlantis, the Ocean Master, Orm! 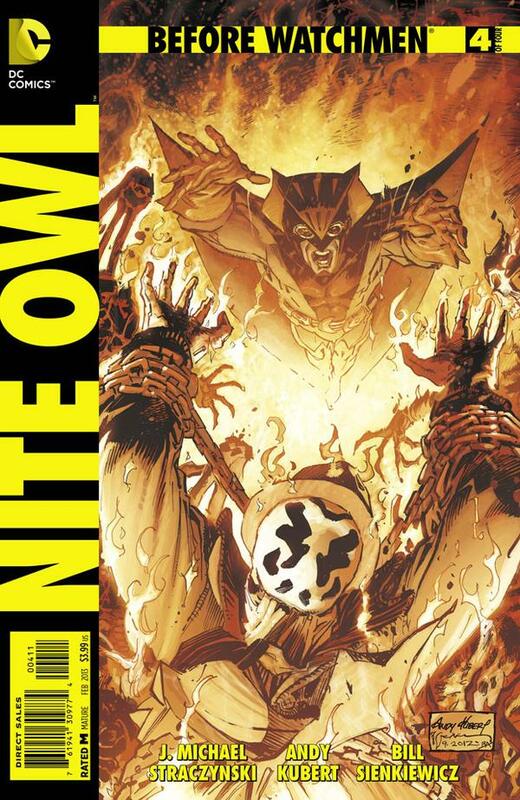 Before Watchmen: Nite Owl #4 (of 4) - "Sometimes to make things right you have to do things wrong. I'm willing to do those things. I've always been willing to do them..."
Wow so that's it for the comic books of 2012! Great year for me...I'm such a DC junkie these days...hope you guys liked it too! Oh, by the way, I DID buy the big Marvel Comics "final issue" last week - Amazing Spider-Man #700. There's a gazillion reviews and spoilers galore all over the internet about this book, so I decided not to bother writing about it. However, I will say that although I normally really like it when comics move away from the status quo, in this case I don't think DC needs to feel threatened about ME switching sides any time soon. Which is a long winded way for me to say "meh." Uh..Make Mine DC! Tomorrow's New Comic Book Day has me excited as we get the new issues of Superman, The Flash, Batman, Incorporated, Teen Titans and more! I can't wait! Oh well, since we HAVE to wait anyway, you can check out how my year went over at Stryder's Dementia...or just stare at the pic of geek-fantasy girl Olivia Munn I stole from somewhere...it's all good! Have a great week and a wonderful year! 2013! Woot! Peace babies! The Office (UK) / The Hobbit Crossover Video! Luke's Top Ten Favourite Films of 2012! Luke's Top Ten Favourite Video Games of 2012!